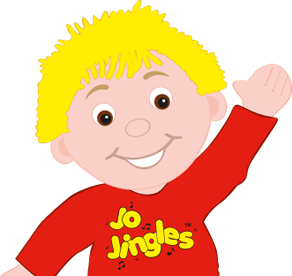 Welcome to my Jo Jingles classes in Bramhall, Cheadle Hulme, Heald Green, Cheadle, Marple, Glossop and coming soon Hazel Grove! I worked with Jo Jingles as a class teacher for 2 years and I loved it so much that when the opportunity came along to run my own classes I jumped at the chance and now here I am! Since I was a young teenager I knew I wanted to work with children, so when I left school I went to college and did a National Diploma in Early Childhood Studies. I then went on to do my Higher National Certificate in the same subject. I worked at Holly Grange Montessori Nursery in Stockport for 2 years and whilst I was there I met ‘Jo Jingles’ who ran classes in the nursery. The children loved it and so did I - it was fantastic to see the way the classes helped the children with so many important aspects of their development, and because they have so much fun they don’t even realise they are learning! 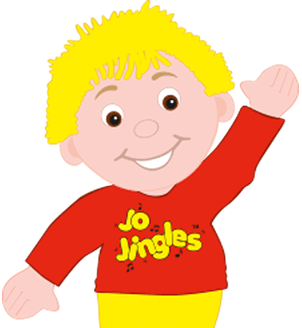 I was very lucky to be offered a job as a class teacher for Jo Jingles in South Manchester and I did this for 2 years. When I heard about the fantastic opportunity to run my own classes and business doing something I love I jumped at the chance and haven’t looked back since! My name is Sue Pamp and I live in Stockport in Cheshire. 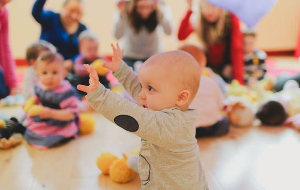 The Sure Start Children's Centre started offering your programme with Laura at a local Children's Centre (Lady Bridge in Cheadle Hulme) in March of this year. My daughter, Marianne, who is 2 and a half, is an extremely introverted child. Each time I would take her to a new activity, she would cling to me for the first hour and a half and then let go. This ritual would continue for about 5 or 6 sessions and then she would eventually wander to settle into the group. If I didn't continue to go, this clinging ritual would start all over again after a week or two of missing the group. I took her to a puppet show once, and she was totally frightened of all the puppets but then settled down and eventually touched a puppet at the end of the show - the very one that had frightened her the most! 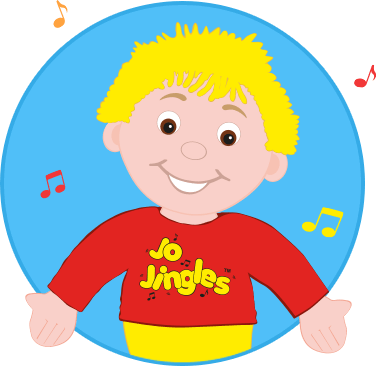 Jo Jingles is a really good program for just SUCH a child. She can sit on my lap and it doesn't matter at all, in fact, it's part of the program! The first class she sat with her face buried in my chest. The second class we got there before everyone else, and she sat beside me on the floor. The third class we were a bit late, but she sat on my lap and faced the class. Then there was a break of a few weeks for end of term break and as the three sessions were a trial session to see how the program would go over. We went back after the end of the term break, and she sat beside me on the floor. She was talking and participating in the group and laughing at Laura's surprise reaction to what was in Jo's bag. Laura was amazed at how Marianne had come along, especially considering there was a break of at least 4 weeks from when she last saw Laura. Classes started back up again April 21st, and we have had three sessions, this last session, she actually walked to within 2 feet of Laura to hand her the blanket - THIS from the child who wouldn't move 1 foot away from ME! She also loves the songs and in between the two terms she would ask me to sing songs from Jo Jingles or other songs. Eventually she would sing the song after I sang it through a couple of times, at her request. She doesn't sing at the group, but that is fine she is now starting to lay down by herself for 'sleeping bunnies' and she actually HELD an instrument and played it this last session. First time ever! Usually I have to play the instrument, what an amazing feat! Even though she isn't actually singing at the Children's Centre, she is still benefiting greatly from this program. This program has really helped her to come out of her shell, and I am thrilled that I am able to take her to it. We both enjoy it a lot. 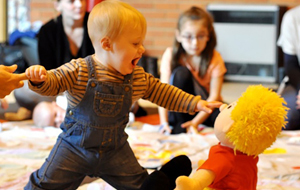 So if you have a child who is shy and withdrawn, this could be the best program for them. There is no pressure for them to go away from Mum, and in time they will develop the confidence to move that little distance away into the group. Another mother at the group commented on Marianne's progress from shy and face buried in Mummy's chest to moving away from Mummy and dancing with the other kids. Wonderful programme and I am thankful to the Sure Start Children's Centre for putting it on for us.